Liza used to say that she saw her past life as a string of roughly-graded balls, and so did Hilda have a linear conception of hers, thinking of it as a track with detours. But for some years now I have likened mine to a globe suspended in my head, and ever since the shocking realisation that waste is irretrievable, I have been careful not to let this globe spin to expose the nether side on which my marriage has left its multitude of images. Nora Porteous has spent most of her life waiting to escape. Fleeing from her small-town family and then from her stifling marriage to a mean-spirited husband, Nora arrives finally in London where she creates a new life for herself as a successful dressmaker. Now in her seventies, Nora returns to Queensland to settle into her childhood home. But Nora has been away a long time, and the people and events of her past are not at all like she remembered them. And while some things never change, Nora is about to discover just how selective her ‘globe of memory’ has been. 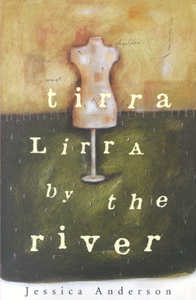 Tirra Lirra by the River is a moving account of one woman’s remarkable life, a beautifully written novel which displays the lyrical brevity of Jessica Anderson’s award-winning style. Jessica Anderson was born in Queensland in 1916 and began writing novels at the age of 40. Since then she has received many awards for her work. Twice she has won the prestigious Miles Franklin award, for Tirra Lirra By the River in 1978 and for The Impersonators in 1980. The Impersonators also won the New South Wales Premier’s Award in 1981. In addition to writing seven novels (the most recent of which is One of the Wattle Birds), her collection of short stories,Stories From the Warm Zone, won The Age Book of the Year Award in 1987.